Prom political Resident A senior ranking political representative (equivalent to a Consul General) from the diplomatic corps of the Government of India or one of its subordinate provincial governments, in charge of a Political Residency. in H.M.S.Fowey at Doha. T o Secretary of State for India, London. 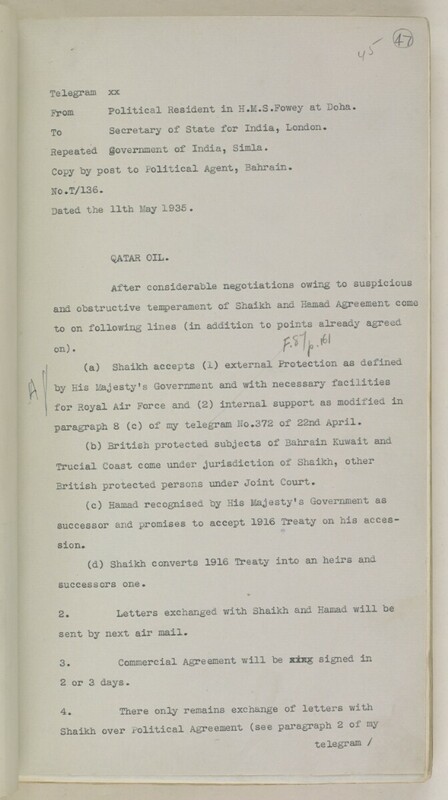 Dated the 11th May 1935 .
paragraph 8 (c) of my telegram No•372 of 22nd April. British protected persons under Joint Court. sent by next air mail.